21 1/4 x 8 1/2 x 10 3/4 in. 8 7/8 x 11 1/8 in. 16 11/16 x 13 7/16 in. 17 5/8 x 13 3/4 in. 13 5/8 x 10 3/8 in. 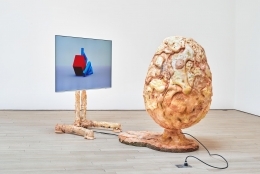 James Cohan is pleased to present the group exhibition Dream Machines. The exhibition considers the point at which the real and the imaginary cease to be perceived as contradictory. As discourses of reality/unreality become an increasingly dominant feature of our day to day lives, Dream Machines posits that artists can navigate across both collecting meaning along the way. The exhibition brings together artists from different generations and nationalities, using a diverse range of materials and processes including David Altmejd, Omer Fast, Trenton Doyle Hancock, Mernet Larsen, Lee Mullican, Jon Rafman, Tabaimo, and Fred Tomaselli. Dream Machines will be on view from Friday,June 23, through Friday, July 28. 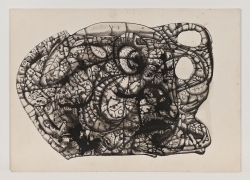 Key to the exhibition are a selection of drawings produced by Lee Mullican in 1945-46 while he was still serving in the Army. Mullican’s time in the army landed him in Japan just after the bombs had dropped, the trauma of what he witnessed never left his work despite its sublimation into deeper and deeper abstraction and automatic processes. 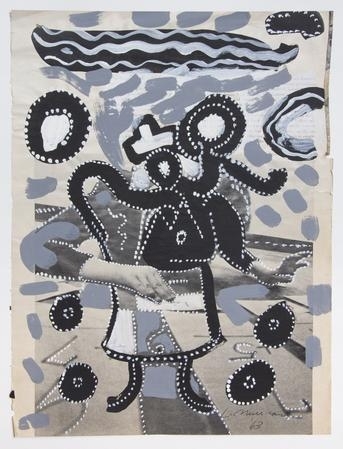 Like much of the work in the exhibition, these drawings are a physical actualization of Mullican’s broader intention to see more deeply into the body. Works by David Altmejd, Tabaimo, and Mernet Larsen manifest the volatility of the psyche through unnatural images of the human body. Altmejd has long probed the head as a site of uncanny potential because the head contains everything; the universe, consciousness, and thought itself. His works equally explore what lies within as what exists without, dissolving distinctions between exquisite beauty and horror.Tabaimo’s quasi plant/organ drawings, like her videos, probe an unsettling morphology intent on drawing out themes of isolation and contagion that lurk beneath the daily existence of contemporary Japan. 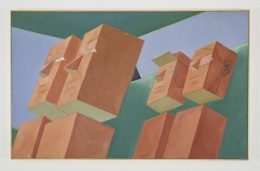 Mernet Larsen’s The Philosophers, produced in 1984, began as an assignment for her students to depict the inner-workings of other people’s minds. 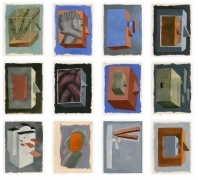 The suite of paintings on paper reveal her interest in psychology and philosophy alongside a persistent willingness to probe less tangible aspects of our humanity. Fred Tomaselli and Trenton Doyle Hancock explore the body in altered states of being and seeing in paintings made from layers of imagery. Tomaselli’s anatomical portrait of a man, Behind Your Eyes (1992), is made from a cocktail of over-the-counter pills such as Tylenol, Advil, Tums, and placebos which are set in paint and resin on wood and presents the body as both a depository of the chemicals it consumes and a visualization of their chemical effect. 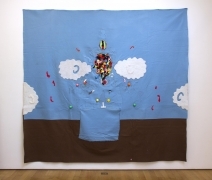 Hancock’s work Forcicle (1999) made of collaged felt depicts the dream state of a “Mound”, the central and highly stylized character of his constructed universe. By accessing a deep space within his own narrative, Hancock untethers himself from the constraints of our own world and compounds the seductions of unreality. Works by Jon Rafman and Omer Fast weave fiction within political and social realities. Rafman’s video installation Poor Magic, presented in self-contained solo viewing environment, is a mixture of body horror and existential probing, inhabiting a technological nightmare that examines the darker side of the human experience through fantastic digital reconstructions. Fast interests himself in the telling and retelling of stories. His work CNN Concatenated (2002) is composed entirely of excerpts from CNN news anchors. The extracts are edited so that each presenter speaks only a single word, but collectively their words form seven short monologues, suggesting emotive personal appeals rather than conventional news broadcasts. The viewer is left with the impression that these soliloquies are the “real” broadcast, reaching out to us through a porous meeting of worlds and readily apparent if only we listened closely enough. Please conatct Jeffrey Waldron at jwaldron@jamescohan.com or 212.714.9500 with press inquiries. For further inquiries regarding the exhibtion, please contact David Norr at dnorr@jamescohan.com or 212.714.9500.